Millie goes for a drive is an attractive and durable board book with curved edges. The colourful artwork, the character of a cute cat called Millie and the simple approach make it ideal for the 1-3 age group. Honk! Honk! The horn blows. Here comes someone that Millie knows. Text and bright pictures combine to build knowledge of basic words and sentences. On the right hand side of each double page is a wide margin which has been sectioned off in four different colours. In each coloured section is a word relating to that page’s text and a picture illustrating the word. I was disappointed that the word ‘airplane’ was used instead ‘aeroplane’ which is more common in Australia. However, parents could simply read the word as aeroplane. Since the children are at an age when they’re not yet able to read the text, they will be none the wiser - at least not until they acquire reading skills. Parents and other carers will enjoy reading this fun story with young children and the curved edges on the opening side make the book easy to handle. 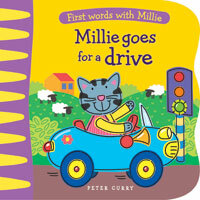 Millie goes for a drive is one of four titles by Peter Curry in a series called First words with Millie. The other titles are: Millie at home, Millie in the garden and Millie goes shopping. BIO: JB Rowley is an oral storyteller, an educator and an award-winning writer who lives in Melbourne, Australia. Her books include the non-fiction novel, Whisper My Secret, and a children’s series called Trapped in Gondwana. JB Rowley's blog. Check out more by JB Rowley on The Book Chook: Children's Book Review, Shhh! Little Mouse, Oral Storytelling - Guest Post.